Here's Carrer d'Avinyó between Carrer Ferran and Carrer de la Lleona in Barri Gotic, Barcelona. Wandering down the streets of El Gotic, blindly meandering through the alleys, while being permeated by the mood, the charm of this historical part of the city, you get so detached that it is not really difficult to imagine how Barcelona used to be inside walls, and particular in this part of casc antic (old town) near the Jewish quarter. In fact, in XIII century the king allowed to open doors and windows in the Roman wall and the old perimeter of El Call (the Jewish quarter) expanded to include Carrers Avinyó and Banys Nous. In El Call de Barcelona lived about 4.000 people, approximately 15 per cent of the city population. Of course, there are the shops and many other anachronisms now but you get the idea. 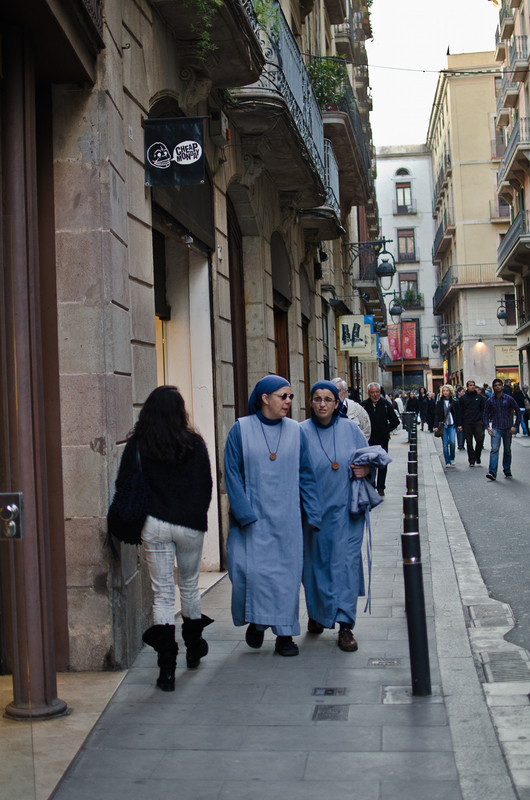 These two nuns in front of the Rent Shop at Avinyó 12 may be of help to reminisce. Nice capture, and lovely perspective too!